The cities of Athens and Sparta were bitter rivals in ancient Greece. Geographically they are very close to each other, but have sometimes had very different values, lifestyles, and cultures. The capital and largest city of Greece. Known in Greek as Sparti. The city lies at the southern end of the central Laconian plain, on the right bank of the Eurotas River. Mediterranean climate. Fairly temperate but very dry. 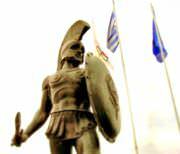 Both Athens and Sparta hold historic value for Greece and the world. Athens is the capital and the largest city of Greece. It is a center for economic, political, financial and culture life in Greece. Athens is the symbol of freedom, art, and democracy in the conscience of the civilized world. Athens took its name from the goddess Athena, the goddess of wisdom and knowledge. Sparta, a town near the river Evrotas, is located in the center of the Peloponnese in southern Greece. Sparta was the Dorian Greek military state, considered as the protector of Greece as it was providing large army to Greece for many years. At present, Sparta is the administrative capital of the prefecture of Laconia. 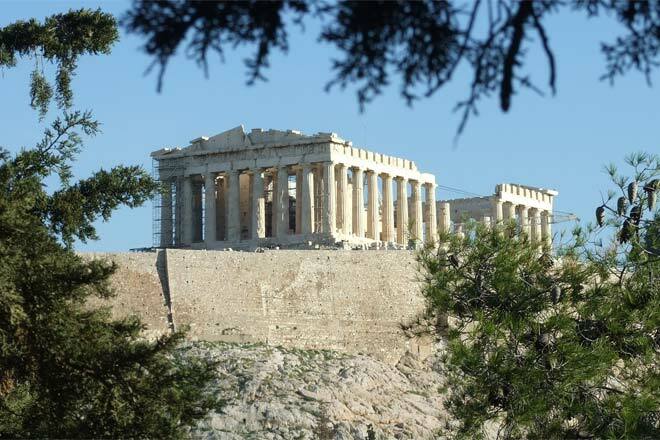 Athens has been continuously inhabited for at least 3,000 years, becoming the leading city of ancient Greece in the first millennium BCE; its cultural achievements during the 5th century BCE laid the foundations of western civilization. During the Middle Ages, the city experienced decline and then recovery under the Byzantine Empire, and was relatively prosperous during the Crusades, as they benefitted from Italian trade. After a long period of decline under the rule of the Ottoman Empire, Athens reemerged in the 19th century as the capital of the independent Greek state. Tradition relates that Sparta was founded by its first king, Lacedaemon, son of Zeus and Taygete, who named the city after his wife, the daughter of Eurotas, around 1000 BCE. Some eighty years after the Trojan War, according to the traditional chronology, Dorian migration from the north took place and eventually led to the rise of classical Sparta — famous as a martial power, foe of the Persian Empire, and eventual conqueror of Athens. After conquering many kingdoms and warring with many communities, Sparta spread to a major empire around 400 BCE. This was also the time of Athens' fall, which proclaimed Sparta superior in the constant war of the two empires. In medieval times, the city of Sparta was destroyed by many invasions. Modern day Sparta, which is known as Sparti in Greece, was rebuilt around 1834. Athens and Sparta differed in their ideas of getting along with the rest of the Greek empires. Sparta seemed to be content with themselves and provided their army whenever required. That is why it considered itself as the protector of the Greek. On the other hand, Athens wanted to take control of more and more land in Greece. This idea eventually led to war between the Greeks. Sparta had a powerful army and Athens knew that they could not beat them but they had the power of a naval unit which Sparta didn’t have. What the two communities had in common was that they were both thinkers. They worshiped their gods and respected people. They loved beauty, music, literature, drama, philosophy, politics, art, and sports. It could be said that some even loved battle itself. Where they differed was that while the Spartans had militaristic values, Athenians were democratic. The Spartans emphasized only on expanding their power and gaining control over other kingdoms while the Athenians also grew infrastructure wise in ancient times. They understood the importance of such growth and concentrated on them besides on military strength. The Athenian form of electing a government was called Limited Democracy while the Spartan form was called oligarchy" (rule by a few), but it had elements of monarchy (rule by kings), democracy (through the election of council/senators), and aristocracy (rule by the upper class or land owning class). Sparta has had two rulers in recent times, who ruled until they died. On the other hand, the ruler of Athens is elected annually. Athens is said to have been the birthplace of democracy. Sparta was an “Oligarchy”. The Ancient Greek “oligos” translates to “few”, while “archia” means “rule” – ‘rule by the few’. Five Ephors were elected annually, accompanied by two kings, who passed on the crowns to their chosen sons. The Spartan equivalent of the senate was its “gerousia”, while Ephors and the Kings would regularly attend the “apella” (general assembly) to develop and try to pass “rhetrai”, or motions and decrees. Other purposes of the general assembly were to vote on and pass legislation and make civil decisions. The process by which this was undertaken was by a simple shouting of ‘yes’ or ‘no’. As a whole, the five Ephors had the power to overrule the Kings, but tended to keep to religious and militaristic duties. Sparta’s system of government was very exclusive and open to members of only the highest social standing. On the other hand, Athens was a democracy, which meant “rule by the people” – “demos” (people, or the masses) and “kratis” (rule). 5000 to 6000 men were narrowed down to a group of 500, who would then be divided into groups of 50. Each would take charge for about a month, and ten generals were automatically elected due to their experience. Others were chosen by a method called ‘lot’ voting. The Athenian assembly, known as the “ekklesia”, sat to discuss political, militaristic and social matters and agendas in the pnyx. This was an area close by to the markets and social centre of Athens, the “agora”. 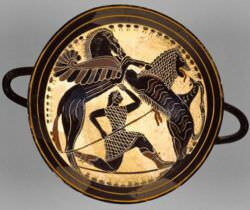 Lakonian Black-Figure Kylix; Sparta c. 570 B.C. Compared to the simple lifestyle of the Spartan people, Athenians had a very modern and open outlook. Unlike Sparta, in Athens, boys were not forced to join the army. As an Athenian, one could get a good education and could pursue several kinds of arts and sciences. Sparta people were not open to education and they only concentrated on military strength and obedience and they didn't interact much with the outside world. Sparta was content to keep to itself and provided army and assistance when necessary to other states. Athens, on the other hand, wanted to control more and more of the land around them. This eventually led to war between all the Greeks. Athens had a Mediterranean climate with great amount of precipitation, whereas Sparta had fairly temperate but very dry climate. 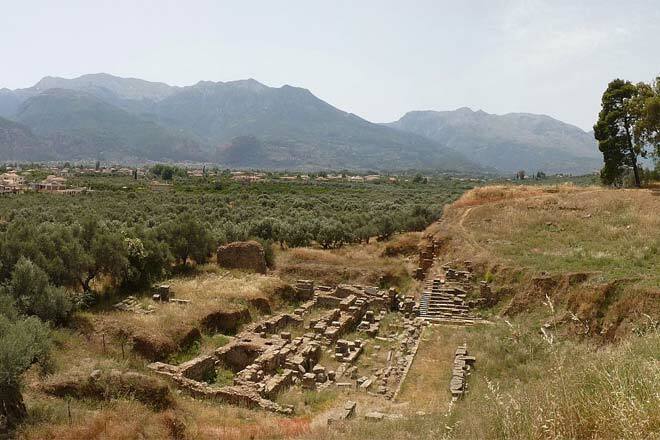 Due to soil erosion and less vegetation, water was a very scanty commodity in Sparta. Family ties in Athens were stronger and women were legally the dependents of their husbands or their father. They could own no property apart from the family. In Sparta, women had rights that other Greek women did not have. In Sparta women were stronger and they formed liaisons with men as they chose. They could also own property by themselves. In Athens women did chores such as weaving or cooking, but in Sparta the women were free of all such chores. Athens and Sparta were two rival city-states, while the latter had very well trained military and soldiers, the former boasted of a good navy. Athens and its allies, known as the Delian League, came into conflict with the Spartans and the Peloponnesian league, and in 431 BC a war broke out between the two cities - a war based on trade routes, rivalries, and tributes paid by smaller dependent states. This conflict, the Peloponnesian War, essentially was a 28-year period of on and off civil war among Greek city-states. (A city-state was a city, such as Athens, and the surrounding country under its influence and protection; Athens and its surrounding area, known as Attica, was about the size of Rhode Island). Sparta had a clear military advantage on land, but the Athenian navy surpassed Sparta’s capabilities at sea; neither side was able to seize and maintain the upper hand. Both sides experienced major victories and crushing defeats, and the war was frequently interrupted by periods of negotiated peace. The war ended in 404 BC with the defeat of Athens and its democracy. Sparta was mainly an agricultural land because of its inland location. The most important imports were metals. In Sparta, men were mainly warriors; others were slaves. Their economy was mainly based on agriculture. Athens economy was dependent more upon trade. Athens became the foremost trading power of the Mediterranean by the 5th century BC. Athens has found its name in Greek history for its undying wisdom and concentration on infrastructural development and Sparta for its military power. "Athens focused on freedom, art, and worshiping the goddess of wisdom, Athena." "Sparta focused on military strength and being obedient." Thanks for the info. :D helped me alot. this website is amazing, just finished a paper with cites and qoutes.